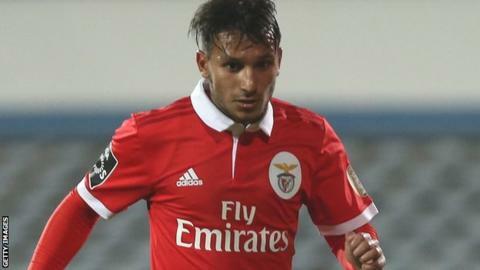 Nottingham Forest have agreed a club-record fee of £13.2m for Benfica midfielder Joao Carvalho and a loan deal for team-mate Diogo Goncalves, reports BBC Radio Nottingham. The 21-year-old Portugal Under-21 international duo are expected to sign on Thursday after completing their medicals. Carvalho played eight games for Benfica in 2017-18. Attacking midfielder Goncalves is set to join Forest on a season-long loan. The Championship side's current record signing is striker Britt Assombalonga, who joined from Peterborough for £5.5m in August 2014. Forest sold him to Middlesbrough for £15m in July 2017. How close were BBC Sport's Championship predictions? Read more on Championship 2017-18: How did BBC Sport journalists fare with season's predictions?